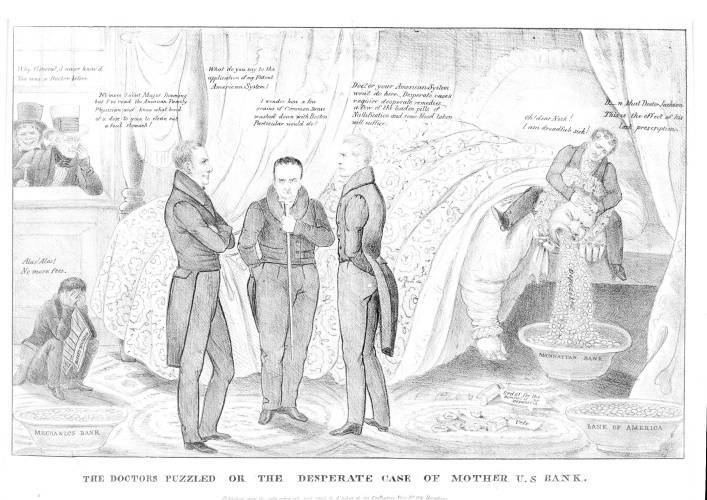 A satire directed against the United States Bank, showing the impact of Jackson's September 1833 order for the withdrawal of federal funds from the Bank and their distribution among state banks. In a bedchamber the Bank, portrayed as an obese woman, lies in bed vomiting coins "Deposites [sic]" into a basin "Manhattan Bank." Nearby are two other basins (filled) marked "Mechanics Bank" and "Bank of America," and two broken medicine vials labeled "Veto" and "Order for the Removal of the Deposites." Bank president Nicholas Biddle holds her head. Bank: "Oh! dear Nick! I am dreadful sick!" Biddle: "D--n that Doctor Jackson. This is the effect of his last prescription." At left stand Bank supporters Henry Clay, Daniel Webster and John Calhoun, as physicians in consultation. Clay: "What do you say to the application of my Patent American System?" Calhoun: "Doctor your American System won't do here. Desperate cases require desperate remedies, a few of the leaden pills of Nullification and some blood taken will suffice." Calhoun's reputation in the North was sorely affected by his leadership role in the southern Nullification effort of 1832. Webster (in the center): "I wonder how a few grains of Common Sense washed down with Boston Particular would do?" On the floor at left sits a man, no doubt a pro-Bank newspaper editor, holding a copy of the "National Gazette," moaning: "Alas! Alas! No more fees." Jackson and Major Jack Downing look in through a window at far left. Downing: "Why Gineral, I never know'd You was a Doctor before." Jackson: "No more I ain't Major Downing but I've read the American Family Physician and know what kind of a dose to give to clean out a foul stomach!"